We offer a variety of trail rides, where no two trips are the same. Glacier National Park, otherwise known as the “Crown of the Continent”, stretches across thousands of miles of snow-capped Rocky Mountain peaks in Northwest Montana. The Glacier backcountry is a land of shining mountains, sweeping alpine views and aquamarine glacial waters you simply have to experience. And, what better way to do that than on horseback? 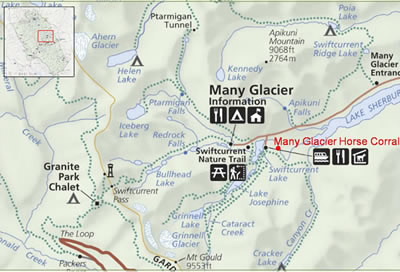 The majority of Glacier’s most magical secrets are found off the beaten track and we can take you to them. We offer a variety of trail rides, where no two trips are the same. Or, for a truly unique experience, check out our drop camp services. 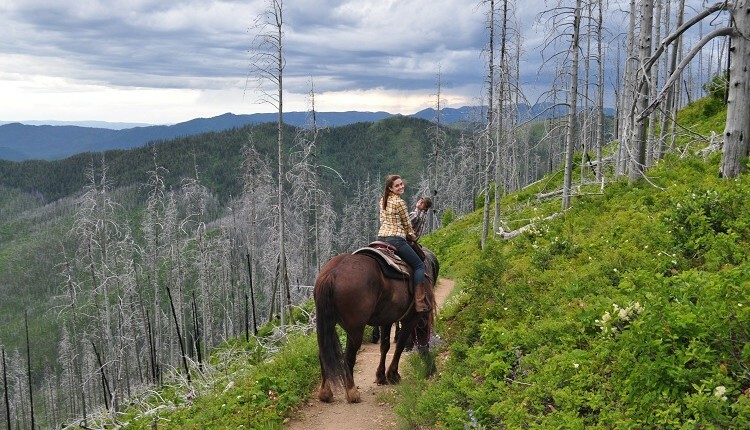 All you have to do is decide which horseback riding adventure you want to embark on from the choices below! Please keep in mind that availability of all trails in Glacier National Park is subject to change. Swan Mountain Outfitters reserves the right to change or cancel a ride at any time due to unfavorable trail conditions, inclement weather or the presence of wildlife. Very thorough and comprehensive safety and setup - excellent. Made sure horses were well fitted and riders were comfortable and ready to ride.